I love it! A new application of the infographic! It makes me want to do one too. Thank you Jan! You should soooo do one! Thank you Anonymous.... I find plenty of time for happiness, I'm happy most all of the time. 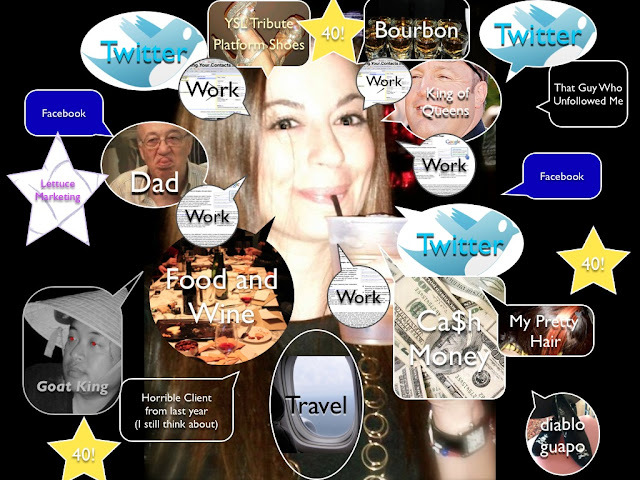 I love working, I love Twitter, I love to travel, I love my family and friends... AND, I LOVE CASH MONEY -- these are all thing represented in my "brain cloud". This is why I love you, Leyla. Our brains think so much alike. Though I prefer Laboutins to your YSLs and Vodka to your Bourbon :-) XOXO! This is so amazing...thanks for sharing a peek into your thoughts...so fun! And the little explanations to make the peek even clearer....your brain is an interesting place to visit! ;-). Very clever Leyla! !